Phoenix—March 20th, 2017 — Food Logistics, the only publication exclusively dedicated to covering the movement of product through the global food supply chain, has named Jonathan Greene to its 2017 Food Logistics’ Champions: Rock Stars of the Supply Chain award. 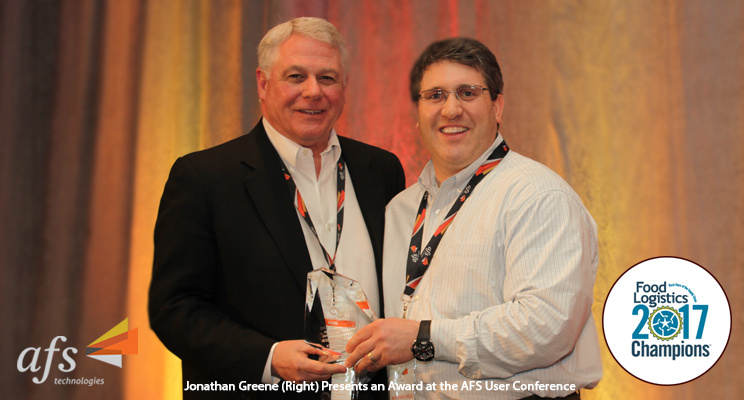 Jonathan Greene, Vice President of Customer Development – Supply Chain Division, AFS Technologies, Inc., has been a driving force at AFS Technologies, Supply Chain Execution Division, and a key advocate for many distributor partners throughout the decades. Many of his accounts have grown from small local distributors to large regional powerhouses. He regularly facilitates open communications, industry roundtables and promotes successful idea sharing through the AFS distributor communities on and offline. As a product manager, Greene also is spearheading AFS Data Exchange, an electronic trading solution that has a 99 percent satisfaction approval rating. The Food Logistics’ Champions: Rock Stars of the Supply Chain recognizes influential individuals in our industry whose achievements, hard work, and vision have shaped and attained milestones in safety, efficiency, productivity and innovation through the global food supply chain. From early pioneers and entrepreneurs to non-conformist thinkers and executive standouts, this award aims to honor these leaders and their contributions to our industry.